Richard has experience in Tai Kwon Do and Kickboxing. He has competed in numerous British National Championships since 2010 in the plus 90KG weight categories. 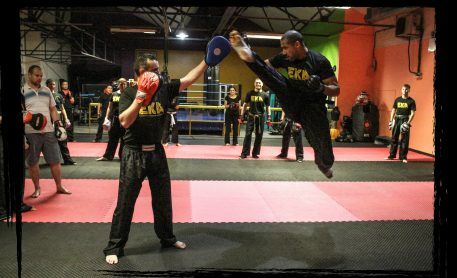 Richard has trained with the Elemental Kickboxing Leeds since January 2010 and graded for his 1st Dan black belt under David Kenyon (3rd Dan) in May 2013, and his 2nd Dan black belt under Brian Beck (8th Dan) in October2015. He has a keen eye for detail with great form. His patience and kind nature makes him a fantastic teacher of the style – however underneath this exterior is a serious fighter wanting to take it to the next level every time.